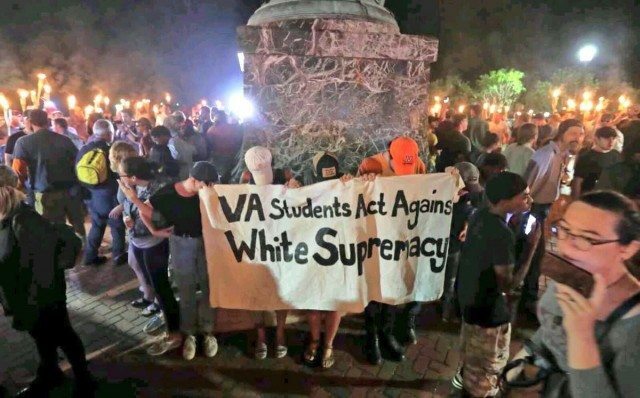 University of Virginia students, who bravely stood up to hundreds of torch-wielding white nationalists that marched on the campus in Charlottesville last weekend. Photo via @CollinRees on Twitter. White nationalist “alt-right” groups are hoping to gain a foothold in Toronto, but they will face strong resistance from Toronto’s anti-fascist and anti-racist community. 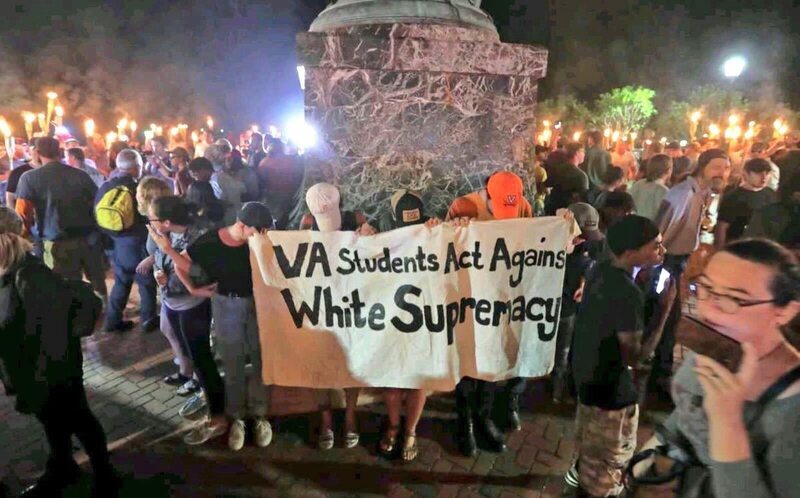 The Unite the Right rally in Charlottesville, Virginia has resulted in widespread condemnation of the “alt-right” in Canada, which is increasingly being understood as a white nationalist or white supremacy movement. One of the most high-profile leaders of the so-called “alt-right” is Richard Spencer. In January, he told CBC’s Paul Hunter that the roots of his movement can be traced back to “an apartment near Yonge Street in Toronto, Canada. Fun fact.” He says he was living in Toronto in 2010 when he launched alternativeright.com. He says the movement is “happening” in Canada, online and anonymously. But, it’s yet to be seen if it ever gets organized and takes to the streets here in Canada. Alt-right leader Richard Spencer marching with the tiki Nazis in Charlottesville Friday night. While the Conservative Party of Canada has earned the support of extreme anti-Muslim groups, in the wake of Charlottesville they are distancing themselves from the “alt-right” brand of white nationalism. Unlike in the United States, Canada’s so-called “alt-right” has no friends in high places who are open with their views, at least at the moment. If they try to hold events, fledgling “alt-right” groups will face strong opposition from several anti-fascist and anti-racist activists, who are already demonstrating, and they have shown they’re prepared to face-off against any groups organizing under an “alt-right” banner. While in the United States there is a growing white nationalist “alt-right” movement, which is very anti-Muslim, here in Canada we have an anti-Muslim movement that has white nationalist groups and “alt-right” participants. Very few groups use the term “alt-right” to describe themselves, even if they espouse white nationalism. However, a few groups that describe themselves as “alt-right” are emerging. The Canadian Nationalist Party cancelled its Toronto rally this morning, following complaints to the University of Toronto and Ryerson University, which said they wouldn’t be host to the event. The party is led by Travis Patron, a bitcoin investor. Only a handful of fringe-right members had RSVP’d on Facebook. One of the many counter-protests and rallies being organized in the wake of the events in Charlottesville. 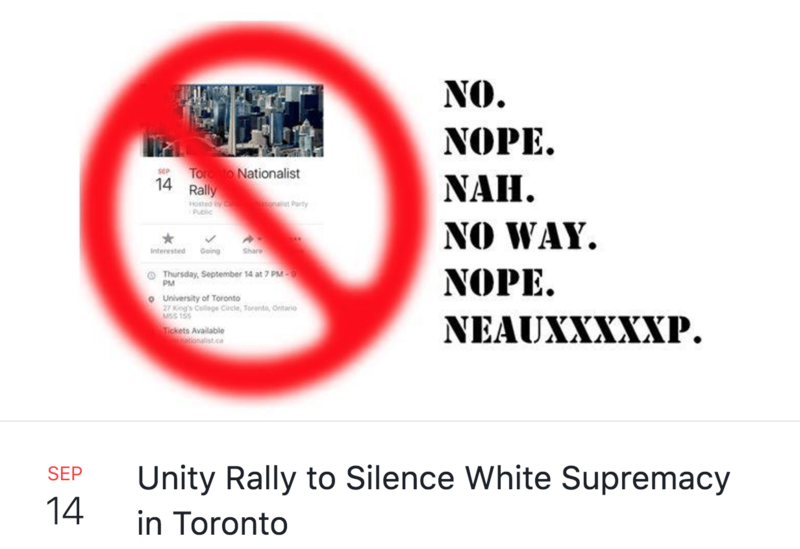 There’s another “alt-right” event planned for Toronto. On October 27, a group calling itself Alternative for Canada, or Alt4Can, will be holding their First Party Conference in an undisclosed location. They are self-described European nationalists. The event page says the event “is an opportunity to get to know other members of the alt-right in Canada and determine the leadership and direction of Alternative for Canada.” Alt4Can does not appear to have any association with the Canadian Nationalist Party, or any other groups. 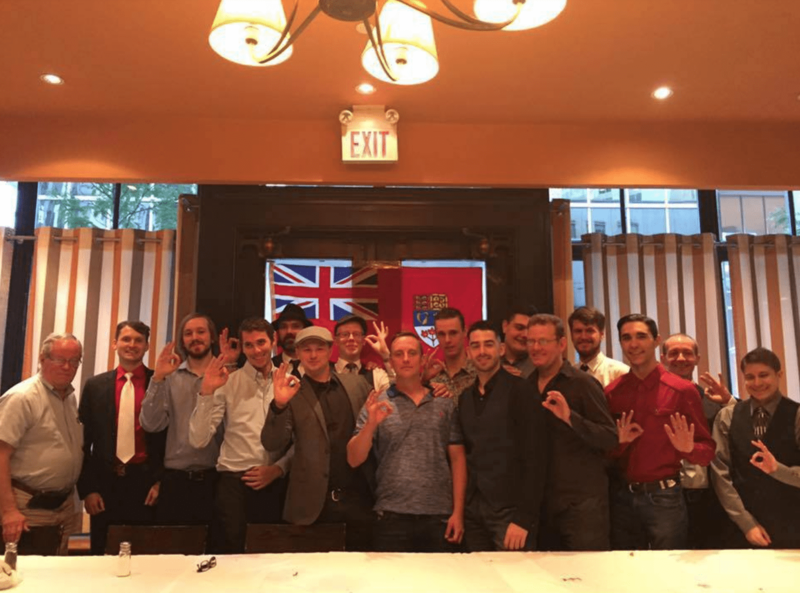 While the so-called “alt-right” in Toronto may not be well organized—yet—there may be enough white nationalists and supremacists in Toronto for groups to form. You’ll find the “alt-right” in three places in Toronto: coming out of Proud Boys groups, on campuses associated with the “free speech on campus” movement, and on the fringes of the anti-Muslim movement. However, when some people hear that the Proud Boys believe that the West is the best, they understand that to mean white, colonial, European culture. Protecting European culture has been used as a euphemism by Canadian white supremacists for decades. The Proud Boys have also taken up the Red Ensign as one of their symbols, which was appropriated by Canada’s white supremacists and neo-Nazis in the 1980s. To be fair, it’s unclear whether the Proud Boys were aware of this association when they adopted it—but it goes a long way to explaining why white nationalists and supremacists have been drawn to the group. Neo-Nazi Paul Fromm (left) with some members of the Proud Goys Facebook Group. Photo posted July 20. 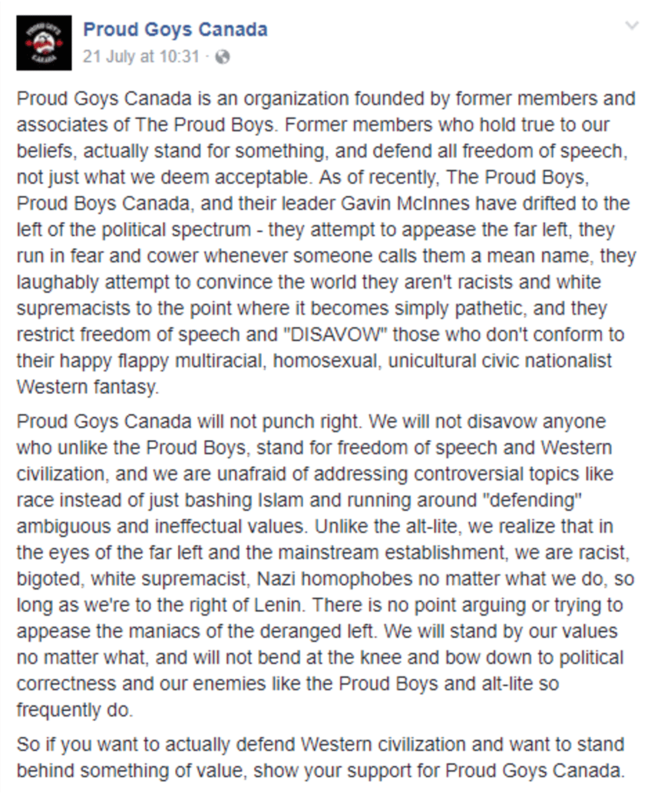 The Proud Boys have made several statements explicitly disavowing Nazis. But, those statements have been viewed as disingenuous by some, and ignored by others. Understandably, they feel mischaracterized by the media. There are also “alt-right” individuals associated with the “free speech on campus” movement. To be sure, there are plenty of principled free speech absolutists on campus, who believe in open and unlimited debate in order to expose and defeat reprehensible views. Unfortunately, free speech advocacy can also be a veil for hate speech promotion. Fromm, for example, runs an organization called the Canadian Association for Free Expression, which argues against hate speech laws on behalf of white supremacists. Patron tells the Varsity that they “have had conversations with some of the members of the Students in Favour of Free Speech [sic], and there are some of them that are supporting us.” A spokesperson for the Students in Support of Free Speech, a University of Toronto campus group, denies the claim. Evan Balgord is a freelance journalist covering the anti-Muslim, alt-right and alt-light movements in Canada and Toronto. You can follow his work on Twitter at @ebalgord.